Catch the next move higher without a Magic 8 Ball. NEW YORK ( TheStreet) -- Within investing success lies a fine line between buying overbought shares and catching the next move higher. Get it wrong and you can watch an entire year's gains (or more) go right down the drain. Get it right and not only do you reap the monetary rewards, but don't be surprised when your neighbor stops by for the second time in a week asking about investments. I am like a hedge fund; I will short a stock just as easily as I buy one. That means I look for stocks that are trading higher and are overextended. I've found in this process of screening that many stocks that are trading higher, but that are not overextended, continue higher, offering an opportunity to buy. Interestingly, stocks often make the biggest and most powerful gains at the end of a move. This common market reaction provides a strong incentive to find trending companies, even when prices appear "too high". I have spent countless hours studying data on companies that are able to reach new trading levels and those that fail to continue higher. While I haven't found a Magic 8 Ball that works, I have found that stocks with certain characteristics tend to have higher performance ability than others. The result is a narrow selection that is near or creating 52-week highs, and have the most favorable investor risk-to-reward ratio. Background: Newell Rubbermaid designs, manufactures, and markets consumer and commercial products worldwide. It offers its products through a portfolio of brands, including Rubbermaid, Sharpie, Graco, Calphalon, Irwin, Lenox, Levolor, Paper Mate, Dymo, Waterman, Parker, Goody, Rubbermaid Commercial Products and Aprica. Founded in 1903, it is headquartered in Atlanta. 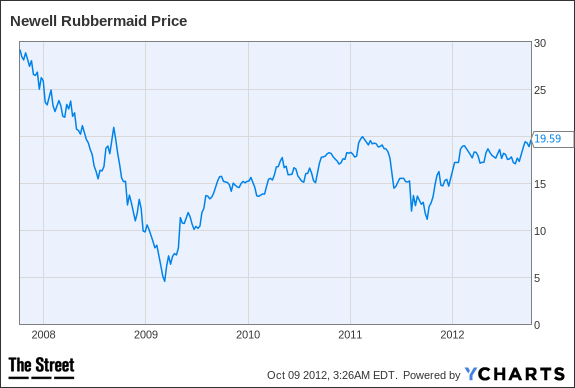 Newell Rubbermaid trades an average of 2.6 million shares per day with a market cap of $5.66 billion. Rubbermaid is once again pressing against the lid of the recently expanded 52-week high. Rubbermaid appears sealed tight with an incredibly high trailing price-to-earnings ratio exceeding 60. Don't let the trailing P/E fool you, though. Sometimes looking at previous financial results is comparable with driving your vehicle using the rearview mirror. Based on analysts' earnings projections, the P/E is receding down to a 10, a premium convincingly within conservative acquisition metrics. Rubbermaid pays a reasonably attractive 2.1% dividend yield based on 40 cents a share per year. The forward payout ratio is less than 30% based on current year estimates. Anything under 50% is considered reasonably safe absent an underlying concern. I like the chart pattern. The chart shows a stock in a bullish pattern and one that is breaking out with durability. After the recent retracement, Rubbermaid's renewed approach of the September highs is typical of a stock that is about to break higher. Background: Time Warner operates as a media and entertainment company in the U.S. and internationally. It operates in three segments: Networks, film and TV, and publishing. Founded in 1985, it is headquartered in New York. Time Warner trades an average of 7 million shares per day with a market cap of $44 billion. Time Warner's average analyst target price is $46.66, a price target that may soon be achieved and exceeded. Time Warner closed within a dime of the 52-week high placed last month during the close of Monday's trading. The 60-day moving average is above the 200-day moving average, which is a bullish indicator for chart technicians. Trend followers seek out this type of consistent bull pattern and will hold a position until a technical break results in a signal to exit. From a valuation outlook, Time Warner isn't selling for a rich premium. The trailing 12 month P/E is 18. The mean fiscal-year estimate P/E is 12.74, based on earnings of $3.20 per share this year. 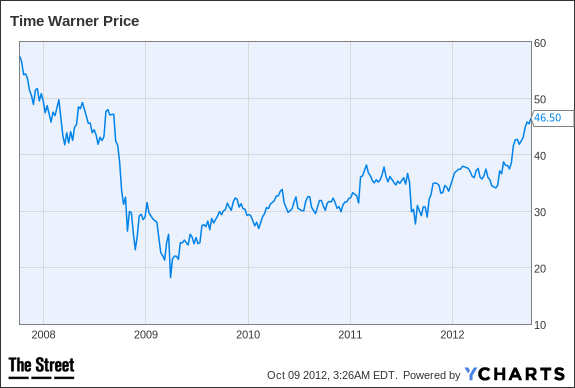 The low P/E leaves plenty of room for Time Warner to continue appreciating. The short interest based on the float is small and not lofty enough to concern me at 3.3%. Bottom line: Expect Time Warner to make a new 52-week high this week or next. Background: Hovnanian Enterprises designs, constructs, markets and sells residential homes in the U.S. It constructs single-family attached and detached homes, attached townhomes and condominiums, and urban infill and active adult homes. Founded in 1959, it is headquartered in Red Bank, N.J. Hovnanian Enterprise trades an average of 6 million shares per day with a market cap of $493 million. In the last month, the stock has really moved higher with a 20.3% increase. Cheap stocks can have impressive moves percentage-wise, but any stock under $5 is typically a bankruptcy candidate. Taken as a whole, the analysts are not bestowing much in terms of market direction. Five out of 11 rate Hovnanian a hold. One recommends this company as a buy, and five recommend selling. The stock appreciated 257% during the last year, and the average analyst target price for Hovnanian is $2.82. Hovnanian is in a bull trend, and looks ready to break higher. The moving averages are moving higher, and shareholders should be happy (at least the relatively newer ones). Hovnanian is almost a bet on the Fed. If the billions of dollars keep flowing, housing should, in theory, pick up. The dollar may be worth less than a roll of Charmin, and a six-pack of beer may cost $50, but your mortgage will likely no longer be underwater. The short interest is not small for sure. When more than one out of every four shares available to trade is short, short-sellers are smelling blood. The current float short is 26.9%. If you believe QE3 is going to work, Hovnanian could pay off handsomely. 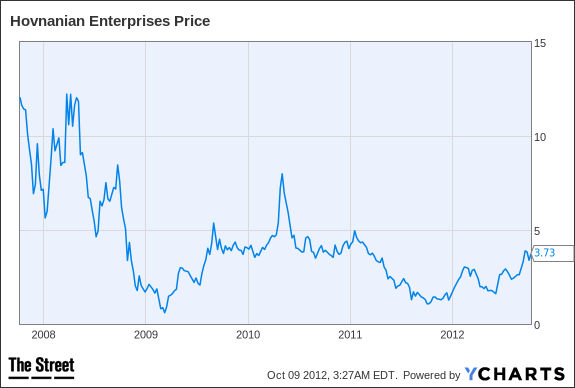 After all, it traded for over $35 a share as recently as 2007. If you do want to gain exposure here, look for an entry near $3.45. Background: Synovus Financial is a financial services and bank holding company, provides integrated financial services in Georgia, Alabama, South Carolina, Florida and Tennessee. Its integrated financial services include commercial and retail banking, financial management, insurance, and mortgage services. Founded in 1888, it is headquartered in Columbus, Ga. Synovus trades an average of 7.4 million shares per day with a market cap of $2 billion. Analyst opinion is mixed. Most of the analysts surveyed don't believe a buy or a sell should be made at this point. Right now, Synovus has two buy recommendations, 18 holds and two sells. The stock appreciated 116% in the last year, and the average analyst target price for Synovus is $2.38. With the target price once again broken, analysts may increase their price targets and rising target prices are often a catalyst for another leg higher in the actual stock price. Synovus is to banking as Hovnanian is to housing; both are Fed QE3 success plays. The chart looks attractive as many small price-hoppers do, but this one looks like waiting for a dip to buy is advisable. I do believe the shares are headed higher; I'm just not fully convinced it's wise to chase the stock. The current proportion sold short based on the float is 6.9%, and I find this much interest by short-sellers worth looking at in more depth. I did look at the short interest trend, and you have to go back to March to find a report with fewer shares shorted. Background: Johnson & Johnson, together with its subsidiaries, engages in the research and development, manufacture, and sale of various products in the health care field worldwide. Founded in 1886, it is based in New Brunswick, N.J. Johnson & Johnson trades an average of 10 million shares per day with a market cap of $191 billion. More than half the analysts covering Johnson & Johnson rate it as a buy or strong buy. Fifteen of the 26 analysts covering the company give a buy recommendation. Eleven analysts rate it a hold, and none of the analysts recommend selling. The stock increased in value 11% during the last year, and the average analyst target price for Johnson & Johnson is $73.80. 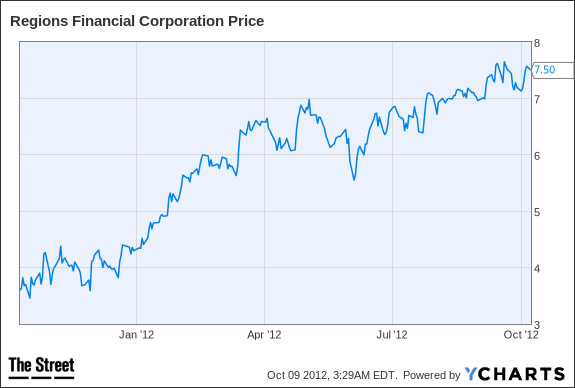 This stock currently has an annualized dividend of $2.44, yielding 3.5%. The yield alone almost justifies an allocation of some capital. Not everyone is convinced buying is the correct choice, though. Along with the 11 analysts with hold ratings, short-sellers are taking an interest. With short interest above 5%, investors will want to monitor changes to know whether short-sellers turn up the warning signals. Otherwise, the current 6% of the float short is relatively small and not a major concern. From a technical perspective, the chart on Johnson & Johnson looks interesting. The widely followed moving averages and price action are strongly bullish. Johnson & Johnson shareholders have to be pleased right now. 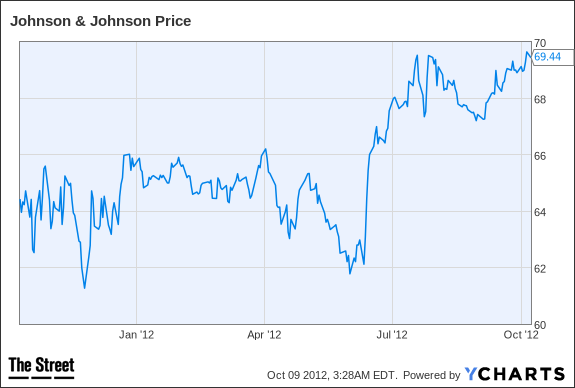 Don't be surprised to see Johnson & Johnson over $70 a share, and within 10 to 15 days. Background: Regions Financial operates as the holding company for Regions Bank, a provider of commercial, retail, and mortgage banking services in the U.S. Founded in 1970, it is headquartered in Birmingham, Ala. Regions trades an average of 18 million shares per day with a market cap of $11 billion. Analysts have not reached a consensus. All else being equal, it's often a bearish indication when the majority of analysts don't get behind a stock. Analysts love to push stocks, and no accord is almost the same as a sell rating. Fourteen of 29 analysts are giving a hold rating. 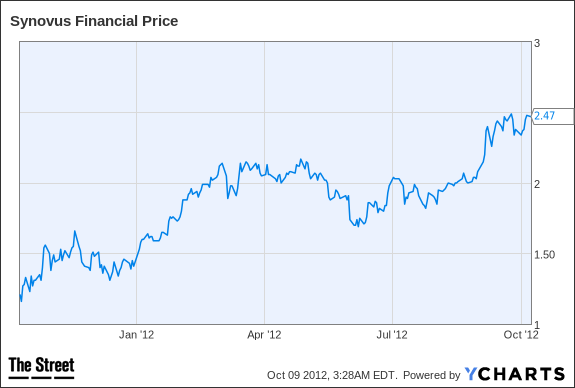 The stock is an eye-popping 107% higher than a year ago, and the average analyst target price for Regions is $7.95. The company currently pays 4 cents per share in dividends for a modest yield of 0.53%. Shares are modestly higher from a month ago. After testing the $7 price support for the second time, the chart is increasingly indicating a test of $8 is on the way. A break above $8 may also mean analysts raising their price targets, which may turn into a self-fulfilling prophesy, especially with a stock that has Regions' momentum. The last reported short interest is paltry and without reason to consider it a meaningful influence at only 1.3% of the average trading float. I use Zacks.com, WSJ.com, Tradestation, and Reuters for my data. P/E is generally adjusted P/E based on an average number of shares. At the time of publication the author held no positions in any of the stocks mentioned.